One of the questions I get a lot is “who is hiring us?” or “can you tell me where to look to find a job?” There are lots of ways to answer this question, and some great resources that you can use to help you find companies that might want to work with you. iSchool Career pages. There is a great list of companies that we’ve worked with in the past on the iSchool Career Services pages on the website. 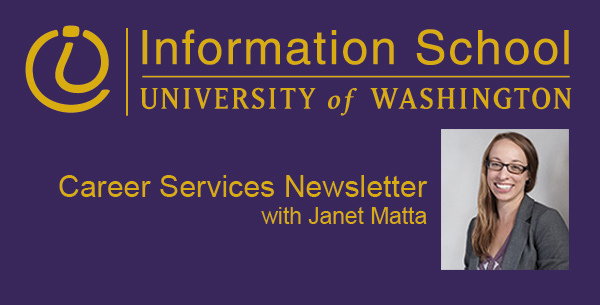 You can find that here: https://ischool.uw.edu/current/career-services/employers . It’s a great place to start if you just need a few extra ideas. Career Center Calendar. When you look at the Career Center events list, this is a great indicator of which companies are coming to campus specifically to recruit UW students. You can use that events list to look for employers who are coming to do an information session, and then do some research about them by looking at the career pages on their individual websites. Job postings in Huskyjobs and iCareers. Look at the job and internship postings that are listed in HuskyJobs and iCareers to get a sense of what employers are hiring. Jot down the names of companies you want to work for, even if they don’t have a listing in those sites that looks like what you want to do, and then go to their career website to look and see what other types of opportunities they might have available. Better yet, mine your network for contacts at that company to have a conversation about creating an internship, or whether they might have any openings coming up that would be a good fit for you. iCareers Employer Directory. Did you know that iCareers has a giant list of all the employers who post in it, and you can view this list? Log in to iCareers, click on “employers” and then “employer directory”. You’ll be able to see hundreds of employers who have listed jobs, internships, or capstones with the iSchool, and you can use this list to start your networking or do further research on company sites to see if they have any open positions that you should apply for. Remember, these lists are just a start, you can generate your own employer connections too! There are new companies being formed all the time, and new companies seeking students and grads to do great jobs. Find even more employer connections by attending networking events, meetups, career fairs, and professional association meetings or conferences. And happy networking!